When we first get into natural health, it is like our eyes are finally open for the first time. There is SO much information out there about healing and it can easily get overwhelming. I went through that state of overwhelm and confusion myself at first. But the longer I am in this world of holistic health, the more I have learned that it doesn’t need to be complicated. There are a few main root causes for a large majority of our health issues. We all just manifest these issues differently thanks to our biochemical individuality. In conventional medicine, they aim to match a drug to a diagnosis with no regard for the person as an individual. In true natural health, we aim to heal the person as a whole so that all issues can be taken care of. The body itself might be complex, but we all need the same basic roots to achieve better health. I see people chase after supplements, diagnoses, nutrients, and so many other rabbit holes searching for that ONE thing that is going to heal them. There is no one supplement, food, or herb that is going to solve all of your health issues- there are always many facets involved. The one thing that really drove me nuts when I first got into mineral balancing was the way that people pick apart nutrients when they take them in isolated forms. Don’t take zinc with magnesium, they both can lower cortisol and they can cancel each other out. Take magnesium at night because it lowers cortisol. Don’t take copper and zinc together because they are antagonistic. Take HCl before/after/during meals, and ox bile and enzymes after (or vice-versa, I’ve seen it all sorts of ways). You need this nutrient to utilize this other one, so you need to supplement both, etc, etc, the list goes on. This sort of thinking is “not seeing the forest for the trees”. If we’re looking at the big ROOT issues, then we do not have to do all of these crazy balancing acts. Gut Dysfunction: The gut is one of the most important parts of our health. When our gut is not functioning we can deal with any number of health issues. 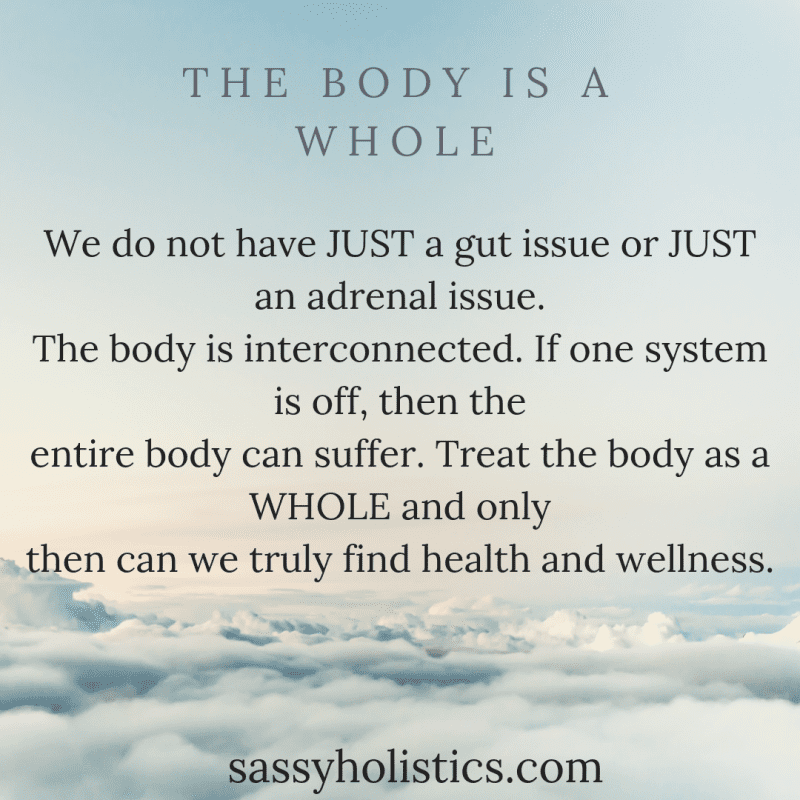 Anxiety, depression, fatigue, chronic headaches, joint pain, and so much more can be due to gut dysfunction. Plus if your gut is not working, you cannot absorb the nutrients you are eating from your food! So instead of supplementing dozens of nutrients because you are deficient, first make sure your gut is functioning. Nutrition: Most of the food in our stores these days is not real food! Boxed foods filled with preservatives and artificial ingredients are not what we’re meant to consume to nourish ourselves. We’re also under the impression that we either can “fill in the gaps” with a multivitamin, or that we need massive amounts of synthetic nutrients to reverse the damage of deficiencies. This is where HTMA can be invaluable so you can see what YOU are lacking, and you can adjust your diet accordingly. Learning how to make the most out of your diet is the best way to fix this issue. Your nutrition will influence EVERYTHING in your body- liver, adrenals, thyroid, brain, colon, etc. It is one of the most important aspects to work on. Detox ability: Our liver, lymph, kidneys, colon, and skin are all important for detoxing. When we get weak or overloaded with toxins, it is hard for our bodies to function. We can harbor pathogens or just toxins in general, which can drain us of much needed nutrients and energy. Depending on what issues we have, it can take a long time to fully replenish our nutrients because as we start to heal we will use up those nutrients to detox and rebuild. Environment: This can be a rough one because there is only so much that we can control. Just do your best in your home! Deodorant, makeup, shampoo, toothpaste, dish soap, etc are just some examples of things that tend to be big offenders for toxins that can mess with our liver function, and they can have very negative impacts on our endocrine function. Learn more here! Underlying Issues: this can include infections, heavy metals, stress, or even emotional trauma. These can start getting resolved as you work on the above, and usually it is better to build up your foundation before jumping into these issues too. For some people, things can get more complicated than the above, or they just need a lot more time and patience to truly heal. But for a large majority, this is “it”. It is a lot to work on, but at the end of the day these main points are what will need to be addressed in order to fully heal. And everything is connected! Healing your gut will help to heal the rest of your body. Working on effective detox will help with taking stress off of other organs. Getting better nutrition will help your body to heal faster. Reducing environmental toxins and working on underlying issues will help to speed things up as well. The sad truth is that many people are really sick right now, and for many reasons. But the more we can be our own advocates and take our healing into our own hands, the more we will truly be able to heal and not get dependent on pharmaceutical drugs and synthetic supplements that have the potential to create more damage in the long run. Real change lies with us!